LAS VEGAS -- Stories of heroism emerged Monday following a mass shooting at a Las Vegas country music concert that left at least 59 dead and more than 500 injured. It was the deadliest mass shooting in U.S. history. Police said the gunman, 64-year-old Stephen Paddock, killed himself in a room on the 32nd floor of the Mandalay Bay Hotel and Casino as a SWAT team closed in. Investigators believe he fired down on the crowd of 22,000 people across the street at the Route 91 Harvest festival as country singer Jason Aldean was taking the stage. An array of local, state and federal officials on Monday publicly praised police, first responders and medical staff who "ran towards the gunfire" and helped others despite the danger. President Donald Trump called the speed with which first responders acted "miraculous" and said their ability to quickly locate the shooter saved lives. Nevada Governor Brian Sandoval said it was the "finest hour" for first responders. He lauded paramedics who treated the injured in "basically what was a war zone" and doctors who responded from all over the area to help treat the wounded at area hospitals. Sandoval also praised concertgoers who were not trained to respond in emergencies but nonetheless put themselves in harm's way to help others. 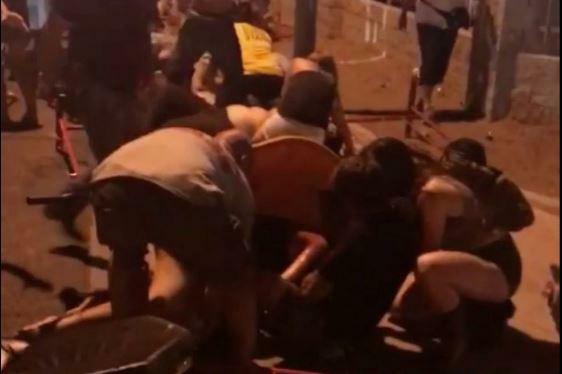 Images emerged on social media showing bystanders carrying the wounded to safety and trying to stop bleeding from their gunshot wounds. "You see courage and compassion there, people helping total strangers, people risking their own lives to help people," Sandoval said. "That really speaks to the character of America. This is the Nevada family at its finest." Witness Lindsey Padgett, speaking in a phone interview to television station WGN, said she helped rush wounded people to the hospital in her pickup truck. "There were just people everywhere and we just wanted to help, to do what we could and pack as many people into my truck as we could and take them to the hospital," Padgett said. In a video posted to Facebook, a man can be heard asking to use the truck, and a woman responds, "OK, go ahead. Put them all in back." An injured woman was seen in the video being carried on a ladder used as a makeshift gurney before she was loaded into the vehicle. Gail Davis, who was at the concert, described the chaotic scene to "CBS This Morning." She said she owed her life to a Las Vegas Metropolitan policeman she called her "guardian angel," who stayed with her and shielded her and her husband from the shots at a concession area of tents. "The officer actually covered up to protect me from being shot because I couldn't get out all the way," Davis said. She says her husband was struck with shrapnel and the officer guided them to a back exit and told them to run and stay low. She said she hopes to find the officer to thank him. Concertgoer Leah Matthews told CBSN she saw people falling as they fled the gunfire who were immediately helped back up by others. She said her friend was shot in the leg as he covered his girlfriend from the bullets. Tennessee woman Heather Gulish Melton told WZTV her husband, Sonny Melton, died because he saved her from being shot. Jeremy Butler, who said he has been best friends with Sonny Melton since he was 3, told the Paris [Tennessee] Post Intelligencer that Melton was shielding his wife from gunfire when he was fatally shot. Radio station WENK reports Melton was a registered nurse. Heather Melton said in a statement to the Nashville station that her husband "saved my life and lost his."